We are developing precise methods to combine chromosome segments and will apply them to improve potato crops. 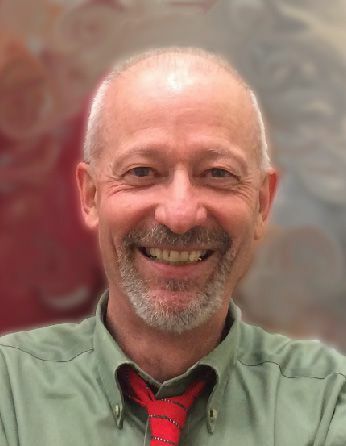 Luca Comai is a Professor in the Genome Center and Department of Plant Biology at the University of California, Davis. The Comai lab studies how hybridization, as well as, chromosome number and type affect gene regulation, development, and genome evolution. Plant breeding involves combining advantageous genomic components into a single plant variety. For thousands of years, it has relied upon the hybridization of natural variants and selection of the best outcome from meiotic recombination. We are utilizing site-directed non-homologous recombination (SNHR) of genomic segments generated by CRISPR-Cas9 in the model plant Arabidopsis and in potato. We have already been able to make chromosomal translocations as well as duplication of targeted segments, frequently associated with perfect junctions. We envisage the creation of a toolbox for systematic, in planta engineering of genes and chromosomes leading to revolutionary improved breeding methods. By leveraging CRISPR in plants, our objectives are to: i) Increase efficiency and usefulness of genomic segment manipulation. ii) Create targeted copy number variation to increase gene expression and trigger gene amplification. iii) Demonstrate the usefulness of these manipulations in potato through duplication, deletion, and translocation of genes and regulatory elements for manipulation of disease resistance genes and starch metabolism genes. Methods for combining useful genomic elements will facilitate functional testing of candidate genes, modulating expression of genes underlying quantitative traits important for agronomic and quality traits, and assembling gene stacks in portable, accessory chromosomes. 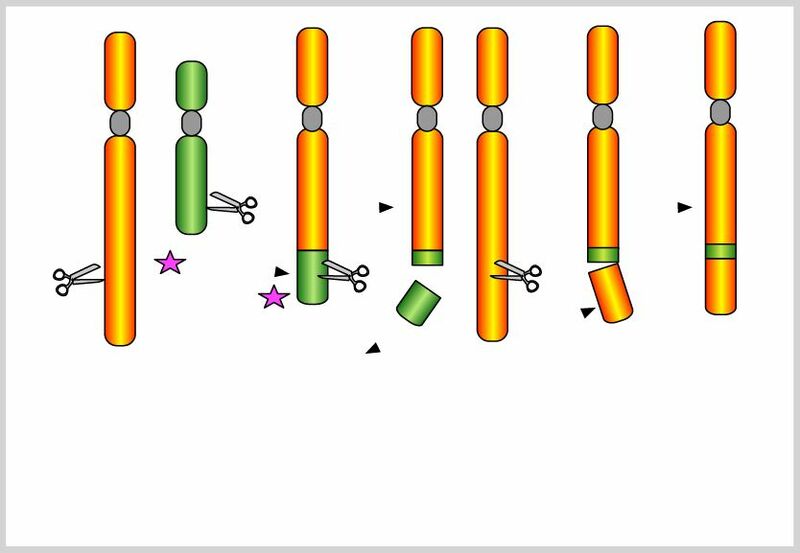 Model for use of CRISPR-Cas9 to targeted selective chromosome introgressions. Scissors: CRISPR-Cas9 complex; Star: Non homologous sequences. The grey oval represents the centromere while the colored regions are chromosomal arms. 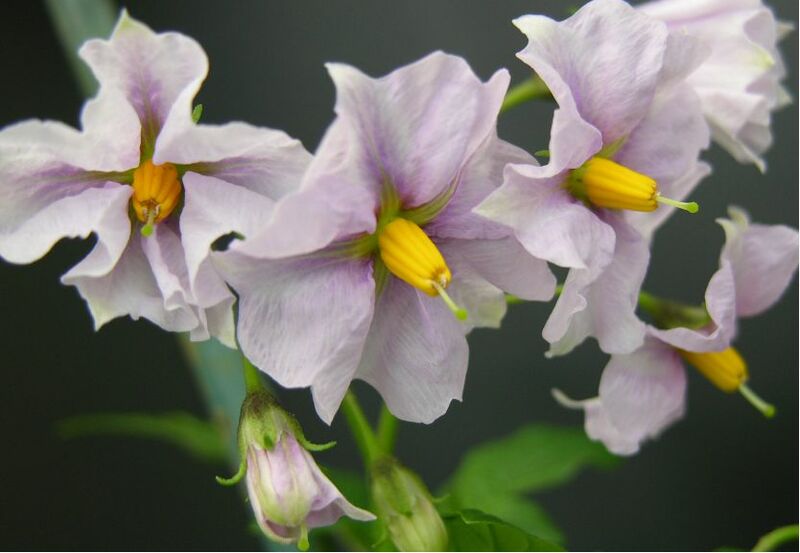 Experimental hybrid between Andean potato phureja and a wild Solanum species. 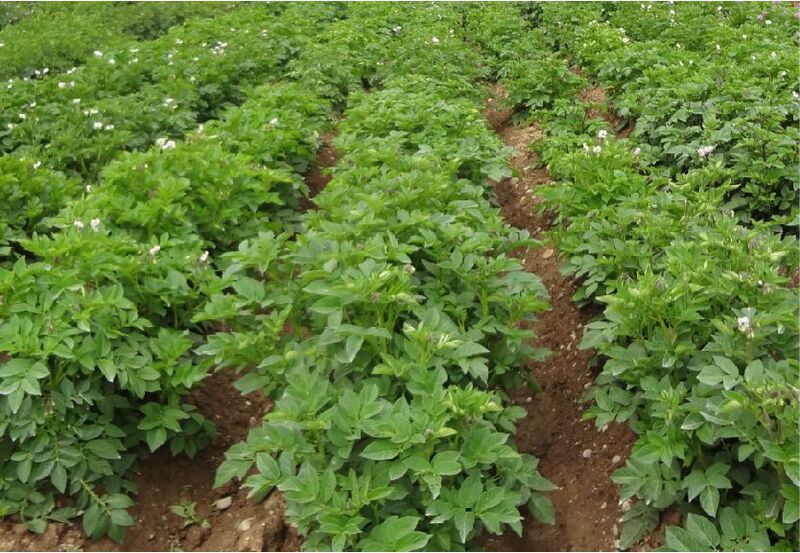 Experimental plots of potato breeding material in Lima, Peru. 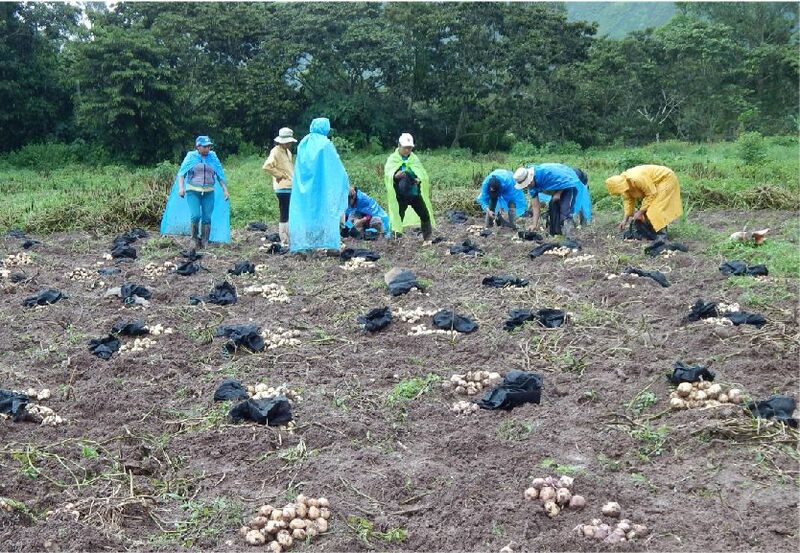 Harvest of selected potato hybrid clones grown under production field condition in the Peruvian rainforest.